Teaching kids to sew on a full-size sewing machine is difficult. Their small fingers make it hard to work with some of the machine’s functions, and there’s always the worry of their hands or fingers being injured. The NEX portable sewing machine is just the right size for kids. By scaling down the size and simplifying the functions of a full-size machine, they offer a kid-friendly option that’s ideal for beginners. The NEX is really compact in size and weighs just 2.2 pounds. Both of these features make this machine a great option for kids. It’s small and lightweight enough for kids to carry and operate with ease. This machine doesn’t have a reverse function. This can make it difficult to start and stop seams. Without a reverse function, your work can easily be undone. Another thing to keep in mind is that this machine cannot sew really thick layers of fabric. It can sew multiple layers of thin fabric. The NEX machine also has a built-in LED light, so you can see your work space clearly. The LED light can also help prevent injuries because it’s easy to see the needle’s position. The NEX has a safety cover around the needle area, so you never have to worry about your child’s fingers getting caught in the needle. The cover surrounds the entire area. All you need is some fabric and thread to start a project. But again, we’re talking about a beginner sewing machine for kids. When your child is older and skilled enough to complete a really serious project, you can upgrade to a better, full-sized machine. You shouldn’t expect your child to be able to complete advanced projects on this machine. But you can expect to teach your child the basics of sewing. 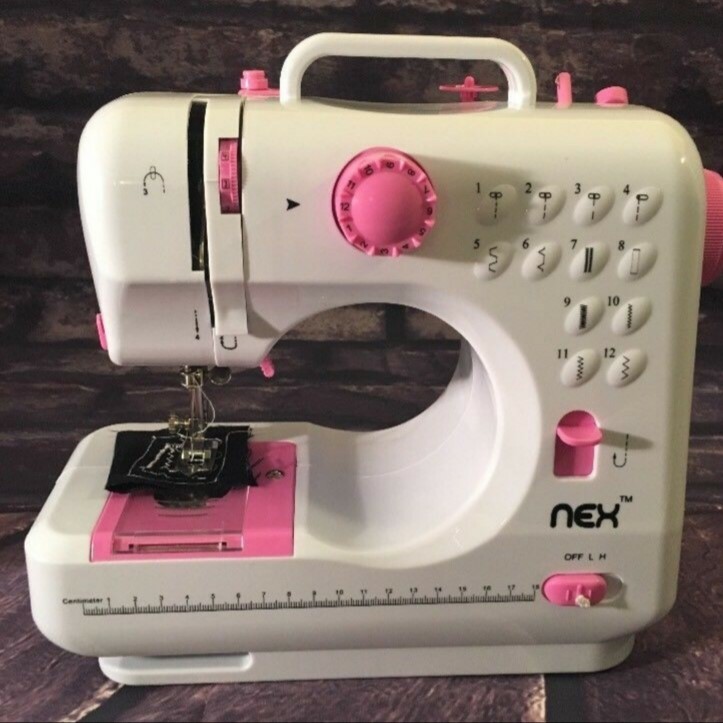 The NEX portable sewing machine is a great option for anyone who wants to get their children interested in sewing. Click HERE to learn more about the NEX portable sewing machine. Enter to win your own NEX Sewing Machine HERE. Giveaway begins 2/1/19 and ends 2/15/19. This is amazing. I would love to have this for my daughter. We have bought her 2 through toy companies for her to learn to sew and for crafts but they have been pure junk and broken in a very short amount of time and our big one is just too big and overpowering for her. What a nice little machine! Looks awesome, my daughter would love it! My granddaughter would love this.She has been wanting to learn to sew. This would be wonderful for my grandchildren. I have 5 that could learn how sew and do crafts. My oldest daughter is just learning to sew. This would be a great hobby for her to learn. What a cute starter sewing machine. Great for new sewers. I would love to win this machine it's so nice! This is a great little machine. I quilt and my Granddaughter is now old enough to learn. She has been wanting to try for so long. I have been looking for a machine that would be simple and easy to learn on. This Nex Sewing Machine is perfect for small hands. She could learn and sew beside me and I can teach her how to make quilts. Thanks for the review, it's so nice to find out about the machines available for kids. Oh my goodness...my granddaughter would freak out over this! Her mommy makes all kinds of clothing. She would feel so cool sitting by her mom doing the same thing. Very nice little sewing machine! I love this cute light weight Nex machine. My daughter would love to learn to sew with it too its so easy. I like the style & the color of this new sewing machine. I would make a blanket or pillow for myself or something original. What a neat little machine for children. The needle being fully enclosed in order to protect little fingers is great. And I couldn’t see very well without that light. This is a great machune for little ones that are interested in sewing. This looks perfect for my kids. I have one for myself so this would be great for them to start learning. Oh this looks so neat and such a great way to teach our kids to sew! I love that its for beginners! I learned to "sew" on a Barbie sewing machine that used glue instead of thread. This is SOOO much better! My daughter is just learning to sew. This would be great for her to try. This machine looks amazing! I would love to teach myself how to sew with this, I could save so much stuff around here! Thanks for sharing! This would be perfect for my little cousin to learn! I'd love to give it to her for Christmas! Definitely on the shopping list! Thanks for reviewing this... my 7 yr old would love this for her upcoming birthday! My granddaughter who is 9 wants to learn to sew. This would be perfect for her. This would be great. My Mom taught me to sew and I make everything, now I want to help my daughter learn. I love that this is a compact size and good for children to use. This would be so nice for my little cousin.